Controlling chemical vapor during AvGas sample testing - Sentry Air Systems, Inc. In 2013, U.S. airline carriers accounted for more than 9.1 million domestic and international flights combined. With the average Boeing 747-8 holding up to 63,034 gallons of jet fuel, it’s no wonder that the U.S. is a leading consumer of aviation gas (AvGas). Long before any of the fuel is pumped into a plane, multiple quality and safety tests are performed to ensure the fuel meets strict requirements necessary for use. The American Society for Testing and Materials (ASTM) developed Standard D910 – Standard Specification for Aviation Gasolines. The specification covers octane rating requirements, density, distillation, vapor pressure, sulfur content, oxidation stability and other important fuel traits necessary for determining safe use. Kerosene, Toluene, Benzene, Petroleum, Naphthalene…..
All of the above hydrocarbons are major chemical ingredients in AvGas and should be handled with caution, in particular regard to vapor inhalation exposure. Chronic inhalation exposure to hydrocarbons has shown to impact the body’s respiratory and central nervous system in addition to affecting the blood stream, bone marrow and bodily organs. The below chart details occupational exposure limits to each of these hydrocarbons along with their associated symptoms. Particular caution should be given to benzene which is considered by the EPA and other health agencies as a known human carcinogen. In addition to chemical fume exposure, lead is a common additive to AvGas as it prevents damaging engine knock, or detonation, that can result in engine failure. Lead is a known toxic substance that results in a host of negative side effects when exposed to in high doses or over an extended period of time. In an effort to reduce lead emissions and worker exposure, the EPA and FAA are working together to fade out the use of lead by finding safer alternatives. When operators conduct purity tests on AvGas samples, they are exposed to high levels of chemical fume. To avoid over exposure, it is important that testing be conducted within or near an air filtration source that captures and filters hazardous chemical vapor. Sentry Air Systems offers multiple engineering safety controls for chemical vapor extraction that come in a variety of configurations. 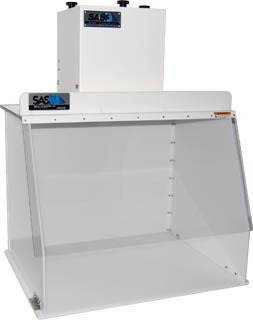 Our most popular models are our Ductless Fume Hoods and Winged Sentry. 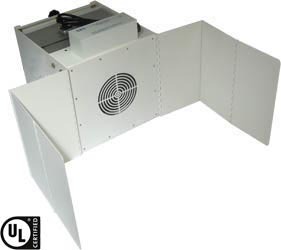 Both are designed for tabletop use and their ductless design allows them to easily move around a workspace and do not require any ductwork or exterior exhaust. For even greater portability, our Model 300 and Model 400 Portable Floor Sentry is also a very popular choice. 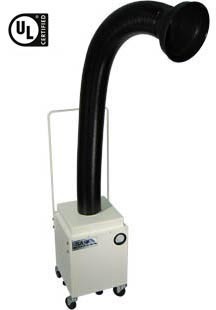 Both come equipped with a semi-self-supportive flex arm that is positioned at the source of vapor emission. These units come with a portability handle and locking casters which come in handy if you require off site or remote testing. Sentry Air’s chemical and solvent fume extractors are equipped with powerful and energy-efficient fans and high-quality filtration media. Options include activated carbon filters and custom-blended filtration media such as acid gas, aldehyde, ammonia, and mercury filters that adsorb chemical vapor within their porous granule structure. Particulate filters are also available for chemical dust control. 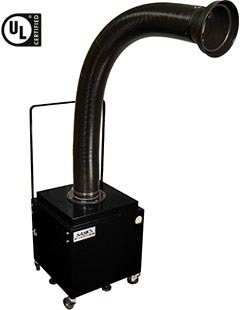 For more information on chemical fume extractors or to receive a free quote, contact one of our technical sales representatives at 800.799.4609, email sales@sentryair.com, visit our website, or fill out the feedback form below.